Applications are invited for Post Graduate Indira Gandhi Scholarship For Single Girl Child for year 2018-19.
a) To support post graduate education of single girl child in non-professional courses only. ** Any single girl child of her parents. In a family if one son and one daughter is available then girl child will not be considered for scholarship under the scheme. ** The scheme is applicable to such a single girl child who has taken admission in regular, full-time 1st year Masters Degree course in any recognized university or a post graduate college. ** This scholarship is available to PG-I year student only. Admission to PG Course in Distance education mode is not covered under the scheme. ** Girl students up to the age of 30 years at the time of admission in PG courses are eligible. 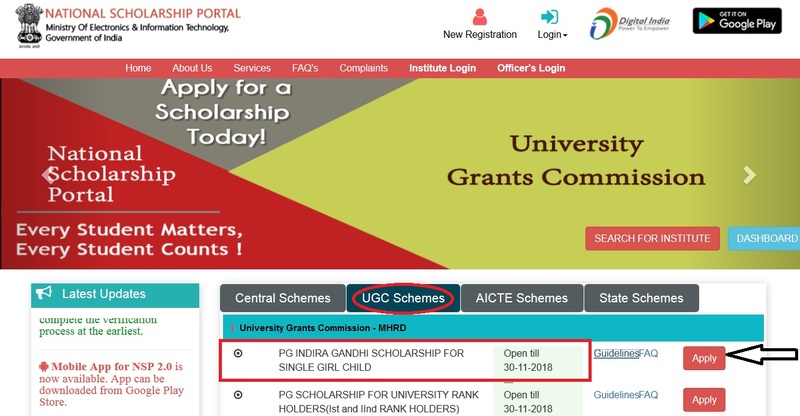 Just follow the below steps to apply for the PG Indira Gandhi Scholarship For Single Girl Child 2018-19. Step 3 : After that Click Apply link in the “PG Indira Gandhi Scholarship For Single Girl Child”. ** Scholarship granted under the scheme will be kept renewed during the period of first degree course, subject to good conduct and maintenance of prescribed attendance. 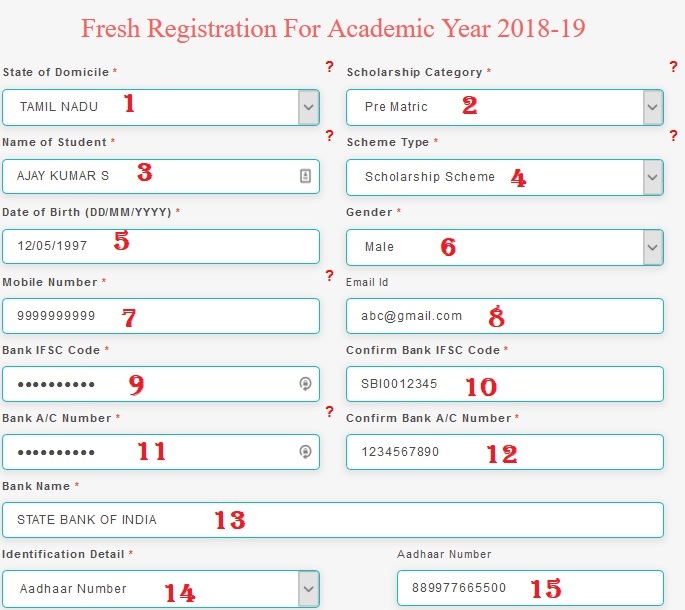 ** The scholarship will be renewed for the next year of study on receipt of annual progress report to be granted by the administrative head of the University/ Institution/ College.(E.g. Registrar of a University/ Director of the Institution/ Principal of the College or any other officer designated by them). ** Change in course of study will not be permitted. If the awardee changes the course of study, the scholarship will stand forfeited from the date of such a change. 1. 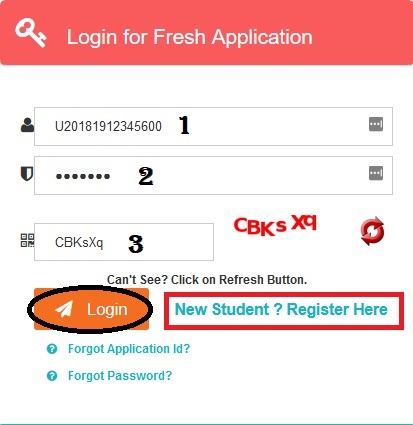 The candidate is required to submit an application only through ONLINE MODE. 2. Proof of admission to Ist Year Master’s degree course in a recognized Indian University covered under Section 2(f) and 12(B) of UGC Act. 3. A certificate from the College/University where student have taken admission to first year PG Course in the current academic year. Amount of Fellowship : Rs.36,200/- p.a. for a period of two years only i.e. full duration of a PG course. No other additional grant will be payable in lieu of hostel charges and medical charges etc. ** 3,000 fresh scholarships will be awarded every year. Last date to submit your applications for PG Indira Gandhi Scholarship is 30th November 2018. I have applied for the West Bengal State Government’s Kanaysree Scheme. I am also a single girl child, Can I get PG Indira Gandhi Single Girl Child Scholarship?